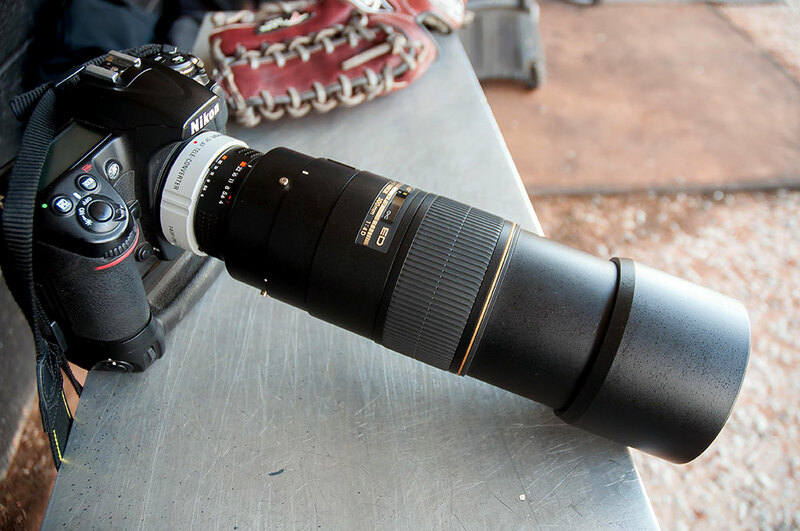 My AF-S 300mm f/4 Nikkor is shown mounted on my Tamron 1.4x teleconverter, on my Nikon D300S, at Thursday’s Allen Mustangs baseball playoff game. Last fall my newspaper bought me a new AF-S Nikkor 300mm f/4 telephoto lens to replace my nearly 20-year old AF 300mm. I’ve been shooting with it nonstop since then, since it is a bread-and-butter lens for long sports like baseball, softball, soccer, daytime football, tennis, and golf. As baseball season has evolved this spring, I decided to up my game by adding my 1.4x teleconverter to my 300mm, making it a 420mm f/5.6. The 300mm already filled up the frame nicely, but I was looking for more. Shooting super tight like that has some serious drawbacks, drawbacks that will completely discourage amateurs from keeping it up. The biggest problem is that your action moves out of the frame, or the frame moves away from the action, with little provocation. The other problem is that since the subjects are moving so much in the frame, the focus tends to bite on the background. It’s all about eyes and faces, and nothing gets into them better than a super telephoto lens like a 300mm or longer. 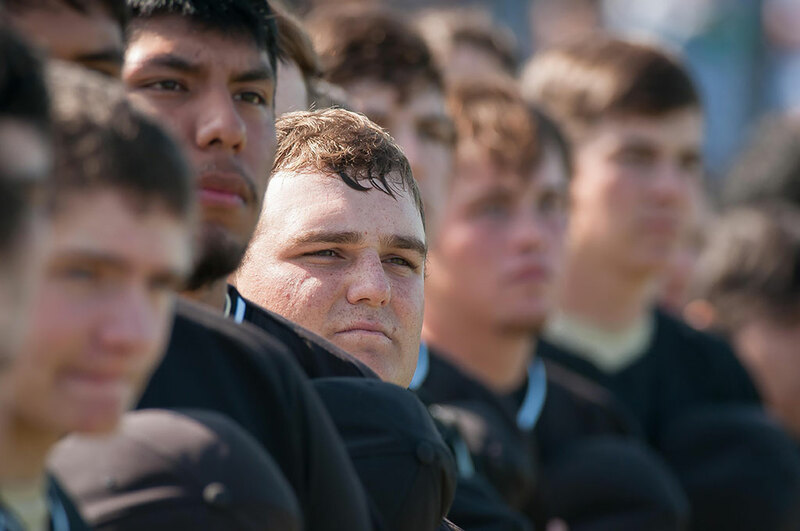 I was shooting playoffs last week next to Oklahoman photographer Sarah Phipps, who was shooting with her 400mm, and she said, “There’s something about the crowd that attracts the focus,” noting that some of her image were back focused. It’s a burden we all must bear. Amateurs deal with these issues by zooming out. Much of the time I see their 70-300mm zooms at their widest settings, since they can see more of the field that way. But their images definitely suffer. It’s one of the reasons I sometimes prefer a “prime” (fixed focal length) lens – I can’t, and therefore don’t, zoom out when the action fills up the frame. I have a 400mm, but it’s heavy and awkward on its monopod, so almost all the time, I shoot with the new 300mm and my Tamron 1.4 converter. I was surprised at how well this cheaper converter took to the new 300, but I think it’s just that the 300mm is so sharp that when the converter takes its sharpness down a notch, it’s still on one of the top rungs of sharpness. 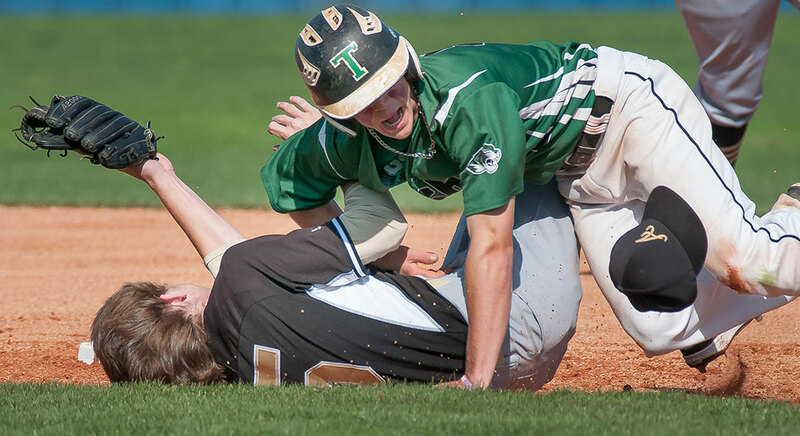 From the first base dugout at Oklahoma City’s Dolese Youth Park, the 300mm plus the 1.4x teleconverter really fills up the frame with second base action. I’m glad this combo is working well for you. I suspect that even after sports take a back seat for a few months, you’ll find great uses for it.